Beijing is an Ancient City with a large number of historic Monuments and Hotspots. At the very center of the City stands its crown jewel, the Forbidden City, the Former Imperial Palace of the Emperors, home of the Dynastic Dragon Throne. Starting with the settling of the Mongol Kublai's who invaded from the North and devasted the original city of Beijing, then named Zhong Du, and through the subsequent Yuan Dynasty (1206 AD - 1368 AD), Beijing has been the Capital City of China, with only brief intersessions, since the Year 1280 AD. The first break was made during the first three Reign Periods of the Ming Dynasty, who moved the Capital to Nanjing (Jiangsu Province) in 1368 AD. Only half a century later, in the year 1406 AD, during the Ming Dynasty (1368 - 1644 AD ) the Capital City was moved back from southern Nanjing, the early Capital of the Ming, to Beijing, the key city underneath the Northern Defenses, the Great Wall of China holding off the Hsueng Nu (Northern Tribes), China's Main Enemy. During the subsequent Qing Dynasty (1644 - 1911 AD) Beijing remained the Imperial Capital and the City population and area were enlarged, leaving roughly the layout of the (Central) City today with at its very (geographic) center the Imperial Palace, the "Gugong" so called "Forbidden City" now known as The Palace Museum. Today the Imperial Palace, last restored in the year 2006 AD is largely open to the Public and the Main Tourist Attraction in Beijing. Maps to find your way to and inside the Palace Museum. 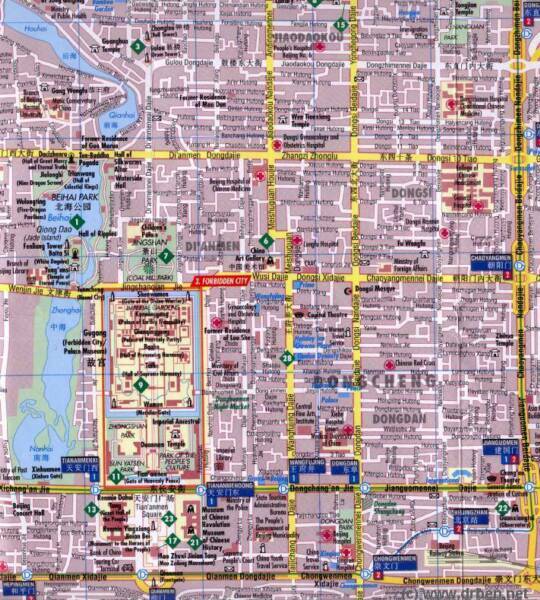 1) A Map depicting All Sites in Downtown Beijing in the Area around TiananMen Square. 2) The TiananMen Square Area, north of which stands huge the Palace Museum, a city within the City. 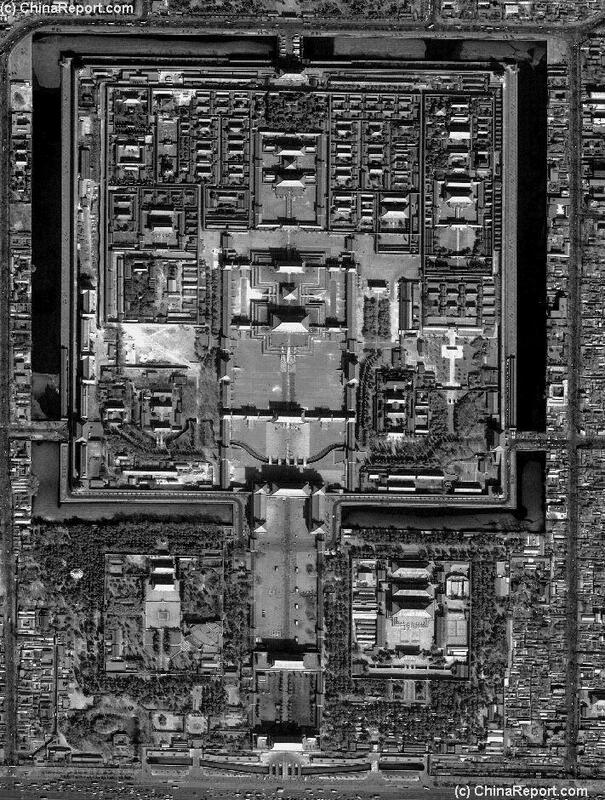 3) The Forbidden City an Overview from Space. The Official schematic Map of The Forbidden City, by The Palace Museum. In the South-West a new corner has opened to the Public Recently (2005). The Palace Museum of Beijing was designed and constructed during the Reign of Emperor Yongle, the 3rd Emperor of the Ming Dynasty. In 1406 AD Beijing, the Capital of the personal Fiefdom of Yongle, the Prince of Yan, was once more designated the Capital of the Chinese Empire. Construction on the Huge Imperial Palace, the largest Palace since the Tang Dynasty, was begun in the same year. Construction would last for only 15 years. Today's Palace Museum is not the same Palace that stood during the Ming Dynasty (1368 AD - 1644 AD). Today's Palace (Museum) covers 720.000 square meters and includes the largest wooden hall in China (TaiHe Dian). The entire palace officially totals 9 Thousand 999 + 1/2 rooms, making it the largest preserved collection of wooden structures in the World. The number of rooms in the Palace is considered very auspicious and of vital symbolic significance as it refers to the number 10.000, the number of rooms of the Palace in the Heavens from which to God(s) ruled and dispensed the mandate of heaven. The Emperor was the Lord of 10 thousand years on earth and as such he bowed to no Man. However, in line with the accepted ancient rules of filial piety, as the Son of Heaven the Emperor did bow to his supposed father, the God of Heaven himself, symbolized by the complete number 10. According to ancient traditional Chinese Theory the Emperor represented the highest form of "Yang" on earth, and his power was symbolized as 9 (or here 9,999), the highest odd number decimal and the closest as a human could come to being God himself. As, according to the rule of filial piety, the Emperor was a good son, his Palace on Earth reflected the Palace in the Heaven's in all respects, except for that it (supposedly) held one half room less, out of respect for the Father in Heaven. According to our sources the 1/2 room is not located inside the Walls of the Forbidden City itself, but should be found at the (former) Imperial Library and Academy (XiCheng District), located due West of Beihai Park and located on BeiHai's Shore. This was a place where the Emperor would regularly confer with his Highest Advisors as well as teach to young officials in training. The HanJin Imperial Academy has its own Holy and Symbolic Imperial Architecture. In reality, in the current Palace there are over 980 wooden buildings and at least 8700 rooms. During its lifetime as the Imperial Palace of China, around 570 years, the complex has been home to no less than 24 Emperors of the Ming & Qing Dynasty. Its last Emperor, Aisin-Gioro Pu Yi, was evicted from his Palace in 1924 AD. The Imperial Palace has been open as a Public Museum since the year 1925. The Palace Museum of Beijing was designated a World Cultural Heritage Site by UNESCO in 1987 AD. Due to the Imperial design of the City (author Ming Emperor Yongle), much of which still determines the lay-out of the Inner City today, the Palace Museum of Beijing is very easily located. Find it as the centerpiece of the Former Imperial City, right in the geographic middle point of City Center. Technically it is part of DongCheng District which starts out across Chang An - Eternal Peace - Avenue from TiananMen Square. Any Map will do. For those who need more, here a few handy maps examples useful for navigation to and from the Palace. Follow the customary Route through the original Main Entrances, passing from TiananMen Square via Tian An Men and DuanMen to Wu Men, the Main South Gate. Tickets can be bought at the Ticket Office West of and outside Wu Men. Those who are already familiar with the Palace can also buy a ticket and enter the Palace through Shen Wu Men, the North Gate of Divine Military Might standing across from Jingshan, the Coal Hill, and its Park. From here pass through to the Palace Garden (Yu Huan Yuan). Tickets cannot be bought at the Western and Eastern Flowery Gates. The East Flowery Gate, in walking distance of Wanfujing Street is reserved strictly for the Palace Museum Administration and Workers. The West Gate is usually closed. 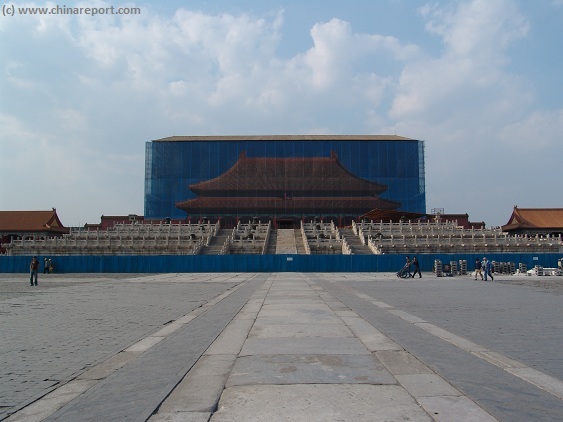 The official name of the former Imperial Palace Grounds Museum is: The Palace Museum of Beijing. However, locally the Palace is known as the Gugong. Internationally the Palace Museum mainly goes by the slang-nickname " Forbidden City". Historically it was known as " Da Nei ", the Great Within, which signified the inaccessibility and Forbidden Nature of the Palace Grounds leading eventually to the name nickname Forbidden City cast by Sir Reginald Fleming Johnston, aptly naming his book on his years at the Imperial Court of Qing Dynasty Emperor Pu Yi "Twilight in the Forbidden City". 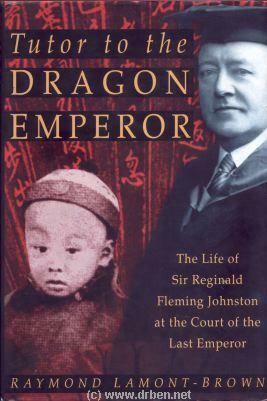 Sir Reginald Flemming Johnston was the only western Tutor to the secluded last Ching Emperor, the boy Pu Yi. 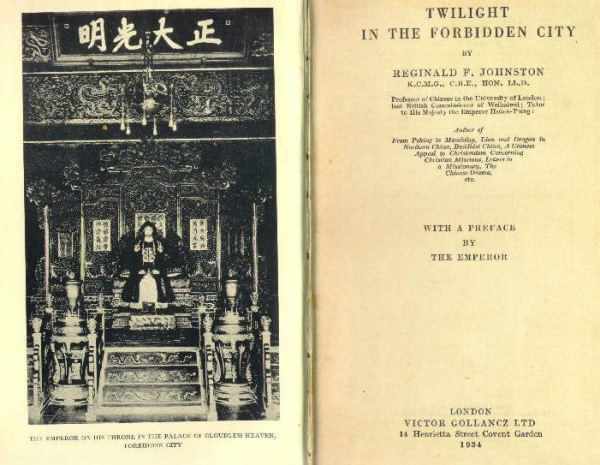 He left a unique account of the Court & Life in his Book "Twilight in the Forbidden City". First and foremost, the construction of a new Capital City and a Giant Imperial Palace required a giant logistical operation. Preparations were lenghty and complicated as construction materials were required and needed to be ordered from all Provinces of the Empire. For instance - the Nanmu Wooden pillars holding up the Pillars of all main Halls were imported from far away Sichuan Province, the only region where the gargantuan trees suited for the task were available. The transport route of the wood from Mountainous Sichuan Province to Beijing covered well over a thousand miles. In the construction of the Imperial Palace of the Ming Dynasty some two to 3 hundred thousand workers, artist and artisans were employed. Many involuntarily. Officially, construction started in 1406 AD and lasted until 1420 AD, although there is more to the story. Preparations were lengthy and there was considerable political maneuvering necessary to have the political Capital move North. However, in the end a new Palace was commissioned in Beijing, to be completed in the year 1420 AD. A Grandiose opening ceremony for all Ministers & High Officials of the Empire was held on the Lunar New Years Day of the year 1421 AD. Nanjing Palace, founded by 1st Ming Emperor Zhu YuanZhang is now destroyed and only ruins remain. Not coincidentally, the Palace Museum was built on the exact location of the earlier Dadu Imperial Palace of the Mongol Yuan Dynasty (1206 AD - 1368 AD), the one that was eliminated by Ming Founding Father Zhu Yuanzhang. 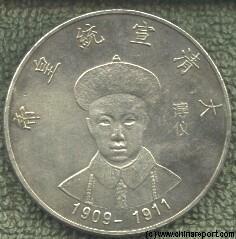 Last Ching Emperor, the boy-king Aisin-Gioro Pu Yi, Emperor Xuan Tong (Reign 1909 AD - 1911 AD) as depicted on a Qing Dynasty Silver Dollar. Elevated to Emperor at the young age of 4, Pu Yi, son of Loyal Prince Chun (2nd) spent all of his life imprisoned in his own Palace, secluded from reality by his own courtiers, as vividly depicted in the epic Film "The Last Emperor". View of the north-western Watchtower, Pavilion on the Moat with the Jingshan and its Park in the background. Since the establishment of the First Republic of China, who were in use of the Three Main Halls and the Outer Court from 1911 AD onwards, the Palace Museum has its very own Ceremonial Guard Detail. These Guards not only hold a spectacular parade each sun up and sundown at The Gate of Heavenly Peace (Tian An Men) in combination with the raising and lowering of the National Flag at TiananMen Square, they also help securing the Forbidden City, the Palace Museum. ceremonial, the responsibility for Security at The Palace Museum is shared with the Beijing Police (aka the Public Security Bureau). The Beijing City Police has its very own Police Station located due East of the North Gate (Shenwu Men) and North of the Imperial Garden, inside the Palace. If your property has been stolen and need a receipt for insurance, or if you are in other need of Police attention, head for the Police Station of the Palace Museum. Directions are given on signs inside the Palace Museum, or otherwise, one can ask a member of the Palace Museum Staff, who are on hand in numbers. In modern days this means that the Guards detail is on regular patrol within the Palace Museum to ensure the security of all visitors and if possible their belongings as well. In recent years the Palace Museum has been a favored spot for pick-pockets, due to its large tourist crowds with plenty cameras and other items to steal. However, since Patrols have been stepped up and central security camera systems have been installed the problem has dwindled. Mostly, the Guards keep an eye on unwanted tourist activity such as climbing walls or monuments, vandalism, possible theft, arguments and brawls and other incidents. These are uncommon. Guards on Patrol at the Palace Museum. the Palace Museum began on April 10Th of 2005 and are scheduled to last for a staggering 19 Years. In the process the Palace Museum's exteriors as well as interiors will be restored its original splendor of Times long Past. Over the recent years (2005 to 2007), large scale renovations have been underway on an area of the Outer Court (Wai Chou) which has previously been off limits for the visiting public. Today, after years of rebuilding and careful renovations of the ancient structures and art, the Hall of Literary Glory (Wen Hua Dian) is open for your visits. Read the Details of the Earliest History of the "Forbidden City", an architectural arrangement first conceived at the advent of the Mongol Yuan Dynasty (1271 A.D. - 1368 A.D.) but layed down among a Feng Shui inspired Chinese plan that would become a tradition held in honor by later Emperors and Dynasties. Find out more about the changes made to the Palace when the Qing Dynasty came to power, important events, fires and other histories of the Forbidden City during the rule of the Manchu Qing Dynasty. main palaces on the Central Axis, is already complete. The Hall of Supreme Harmony (Taihe Dian) under renovations in May of 2005.
grounds will be opened to the Public after renovations. The "Forbidden City" in Beijing is by far the largest Royal Palace in the world. As such, it can not be shown nor described in but one page. Learn many more interesting details about the Forbidden City and its History, by navigating through the various parts of the Complex, which have been separated into separate Chapters for better comprehension and easy of use. 1) The Outer Gates, the Walls and the surrounding Moat. other Gates and Watchtowers of the Palace Museum. Eminence (Wu Ying Dian) and the Hall of Literary Glory (Wen Hua Dian). Six Eastern Palaces, the Nine Dragon Screen and Palace of Peaceful Old Age and more. Apart from its Grandiose Couryards and lofty Halls the Palace Museum has many individual structures, such as a Pavilions and "Studies", Gates, Towers, Platforms, hidden passage ways, Gardens, Rockeries, and the like. Many of them are unique in design and their individual details are almost too many too mention. Most, if not all, of these structures carry their own symbolical names, implied meanings and functions and are protected by a multitude of symbolic elements for protection or auspiciousness. To gain a deeper understanding on the Life, Culture and Thought of those living within the Walls of the Palace and become an expert on the details of the Palace Museum and read through the Chapter on the Structures of the Forbidden City (Palace Museum). The Museum has a collection of well over 1 million items, the number of which has been steadily growing in the years since China's economic succes and new archeological finds and excavations. The bulk of the original collection includes articles of daily use by the emperors, empresses and consorts, stone tablets and carvings, gold and silverware, ceramics, lacquer ware, cloisonné, enamelware, items used for calligraphy and painting, textiles, clocks with frames embedded with precious stones, and many other valuable articles which had been amassed by the imperial court. Many valuable items which had been in private collections beforehand, have been bought at auctions by the Museum or Private Chinese Donors and have returned to the Palace Museum today. New Exhibitions have been added in the years since 2002 AD. Read all information about the many exhibitions found at the various Palaces, Halls and side-Halls of the Palace Museum in Beijing. Construction of the "Forbidden City" followed the principle of "Offices in Front, Living Quarters at the back ; Ancestors on the Left, Gods on the Right." a design pattern followed throughout traditional Chinese society. The Emperor held court with his Ministers in the Halls in the front (south) parts of the Palace.The Back part (roughly the north half) of the Palace was reserved as living quarters for the Emperor, Empress, Concubines and Consorts, and the like. Old birds eye view photo of the Palace Museum revealing the Central Line and its main structures. The last one these is the Gate of Divine Military Might. Sacrificial ceremonies to the Imperial Ancestors were held in the Imperial Ancestral Temple (Tai Miao - converted to the "Working Peoples Cultural Palace") on the rights side of the central axis of the Palace. The walled enclosure of the Ming Dynasty Era Altar of the Earth and Grain (Today: Zhongshan, or Sun Yat Sen Park named after the father of the first Republic of China) in turn was placed opposite on the left side of the central axis, according to the ancient principles. Coal Hill (Jing Shan) to the North of the Forbidden City is like a screen protecting the Imperial Palace from "bad elements" notoriously emanating from that direction. 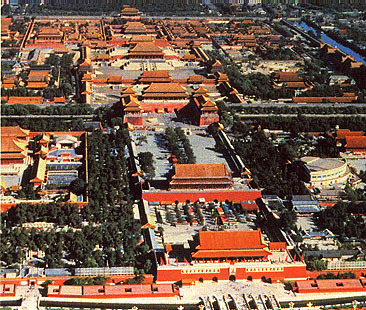 Lying in the center of Beijing, the "Forbidden City" was built on a north-south axis and the Throne is situated exactly upon this central line. This fact symbolizes that the Emperor, living within his Palace, is at the center of the earthly world and under the "center of the universe" (from where the Heavenly Mandate emanated). It also implicated that all lands were the Emperors lands and that all who dwelled on earth were his humble subjects, and who they, as worthy filial sons, owed their reverence. Tweets about "Beijing Palace Museum"